Discussion in 'Archive' started by CM Fragola, Dec 18, 2017. 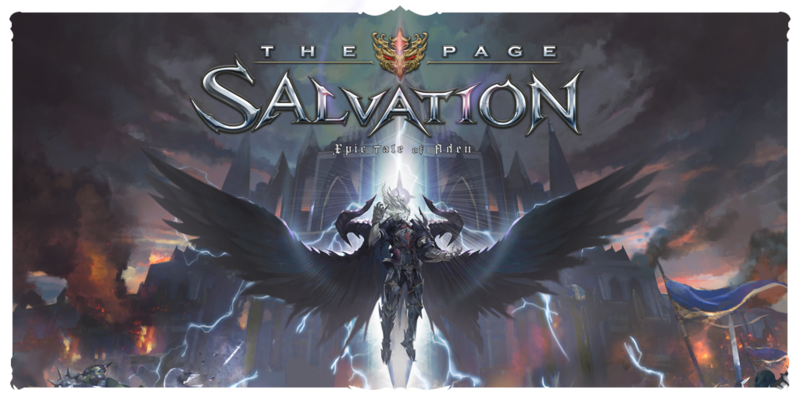 This is the official list of changes in the update Lineage 2 EP 5.0 Salvation! Update version – EP 5.0 0531. Release date: December 6th, 2017. Clan development points are returned when clan Characteristics are reset, but CRPs are not refunded. — Clan Management Functions have been moved from Priests to Clan Management Menu. Clan mission progress doesn't depend on certain members or a number of clan members, it is kept even if characters enter and leave the clan. Registered items require certain clan specialization and can be activated through clan management menu. Resurrection skills don't work, but Salvation can be used. Clans that received 2nd and 3rd place receive 10% and 5% of rating points. 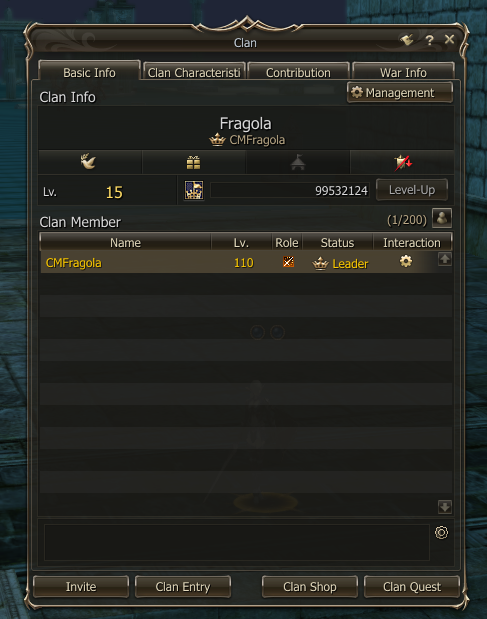 Clan members activity now can be tracked with clan development status. — Clan tokens can be exchanged for new items at Clan Merchants in Rune. — Current Personal Fame has been reset and converted into Personal Fame Tokens that can be exchanged for new goods. — Clan pets now give Clan tokens instead of CRPs. — All clan entries were removed and need to be entered again if needed. Clan War fights CRP deduction is the same (+-1 CRP). 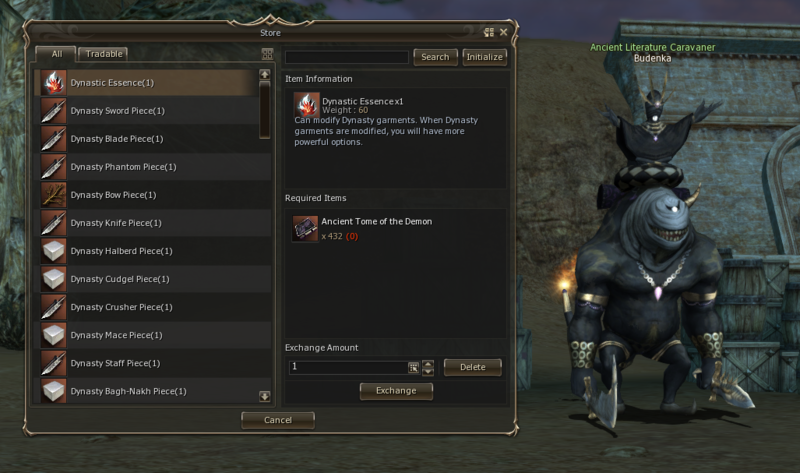 — The payment fee for registering for the fortress siege has been increased 250 000 -> 1 000 000 adena. — HP and stats of fortress NPC have been increased. — HP and stats of Dungeon Bosses have been increased. — Fortress Talisman Boxes can be obtained from NPC Support Unit Captain in fortresses or from NPC Court Wizard in castles. — Suspicious Merchant no longer sells goods. — Suspicious Merchant appears in 24h after the fortress has been captured. — Class Talismans are no longer sold. — Dimensional Sieges have been added. — Dimensional Raids have been added. — When the duration of a listed skill is over, the Limit is used on the target that was influenced by that skill. — If a target is affected by the “Limit” effect and one of the skills stated above is used, skill’s duration decreases according to the level of the limit. — For example, if Lv. 1 Limit of Iss effect is affecting the character, a duration of Battle Rhapsody will be 24 seconds instead of 30. — Now with the addition of the "Limit of Iss", Blood Requiem and Crazy Nocturne can be used together with Battle Rhapsody. Crazy Nocturne and Blood Requiem do not stack - they will replace each other. Have a chance to apply Vampiric Rage effect. Drum Melody For 30 minutes, party members' P. Critical Rate +38%, P. Critical Damage +34%, M. Critical Rate +40, and P. Critical Damage Received -50%. A chance to increase Critical Damage when hit. Guitar Melody For 30 minutes, party members' Atk. Spd. +64%, Casting Spd. +62%, and Movement Speed +30, and MP Consumption of all skills -10%. Pipe Organ Melody For 30 minutes, party members' Max HP +45%, Max MP +70%, and Max CP +45%. A chance to apply the Vampiric Rage effect for 9%. Horn Melody For 30 minutes, party members' P. Atk. +30%, M. Atk. +100%, P. Def. +35%, and M. Def. +40%. 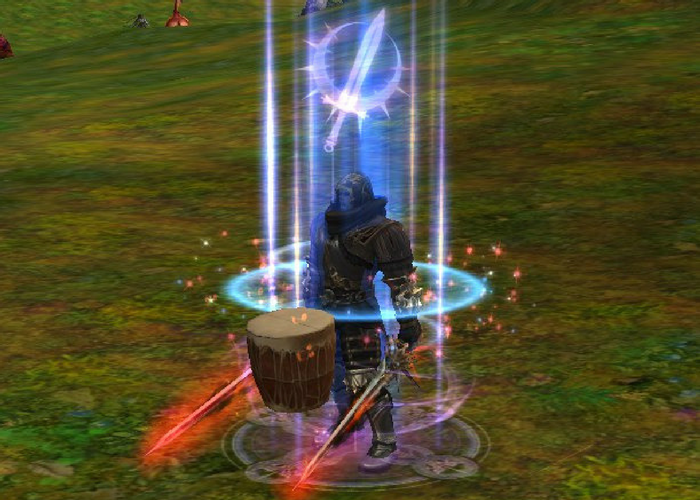 War Drum For 150 seconds, party members' Max HP +30%, P. Atk. +30%, M. Atk. +33%, and magic cancel rate -40. A chance to apply 8% Vampiric Rage effect. Marching Drum For 150 seconds, party members' Atk. Spd. +40%, Casting Spd. +30%, Movement Speed +20, Damage Reflection +10%, and Skill Cooldown -10%. Soothing Drum For 150 seconds, party members' HP Recovery +75%, MP Recovery +100%, and P. Evasion/M. Evasion +5, and MP Consumption of all skills -20%. Resonant Halo 855/86/88/90/92/94/96/98/101/103/105 Increases P. Atk. by 300/325/350/375/400/425/450/475/500/525/550 and Atk. Spd. +5% and allows casting Radiant Crash/Resolving Bash in AoE. Assault Rush Trace of twin edges Iss Hierophant, Iss Spectral Dancer, Iss Doomcryer, Iss Dominator 85/87/90/93/96/99/101/103/105 Rushes toward the enemy to inflict Stun for 3 seconds. Requires sword/blunt weapon/dual sword/dual blunt weapon. Shadow Blade Resolving Bash All Iss Enchanters 85/87/89/91/93/95/97/99/101/103/105 Attacks target with 14608/15776/76944/18112/19280/20448/21616/22784/28162/29386/30610 Power added to P. Atk., for 20 sec. a target's P. Atk./M. Atk. -40%. Requires a sword, duals words, or dual blunt to be equipped. Over-hit. Critical. Crippling Attack Radiant Crash All Iss Enchanters 85/86/88/90/92/94/96/98/101/103/105 Attacks target with 14608/15192/16360/17528/18696/19864/21032/22200/26008/27138/28268 Power added to P. Atk., for 20 sec. a target's P. Def./M. Def. -40%. Requires a sword, blunt, dual swords, or dual blunt to be equipped. Over-hit. Critical. Divine Cancel Dissonance Wave All Iss Enchanters 85/86/89/92/95/98/101/103/105 A chance to remove up to 2 buffs from the target and nearby enemies. In PvP, removes Combat/Marching/Refreshing buffs. Celestial Party Protection Cooldown was increased from 120 seconds to 240. The cooldown is now affected by cooldown increasing and decreasing effects. (Lv. 2) 103 For 30 minutes, the selected party member's P. Def +45%, M. Def +35%, P. Critical Rate/M. Critical Rate +100%, P. Critical Damage +35%, and Shield Defense Rate/P. Def +50%, and a chance of receiving Physical/Magic Critical Hit -25%. (trigger) 101 Triggered by Prophecy of Might. For 5 min increases the P. Atk and M. Atk by 15% and resets Prophecy of Might cooldown. Canceled if Prophecy of Might is cast once again. Death Strike Hands of Einhasad 85/90/95/99/101/103/105 For 5 minutes, P. Atk./M. Atk. +5%/6%/7%/9%/10%/11%/13 and default attack range +150. Inflicts divine magic damage dealt by normal attacks with 50 Power added to M. Atk. (passive) 85/90/95/99 Increases M. Atk. by 20%/25%/30%/35% and Skill Power by 5% and decreases the cooldown of all skills by 5%/6%/7%/10%. For 5 minutes, increases the selected party member's Physical/Magic/Skill Critical Rate and Power by 25%. Consumes 5 Spirit Ores. For 5 minutes, increases the selected party member's Physical/Magic/Skill Critical Rate and Power by 25%. If cast once, it activates the Glaring effect that increases your P. Atk./M. Atk. by 15%, and resets the cooldown of Prophecy of Might. If cast twice, it cancels the Glaring effect. Consumes 5 Spirit Ores. Can be cast on 2 party members. Dual Note 85 For 4 seconds PAtk. and Atk. Speed +5%. Triad 85 For 12 seconds P.Atk. and Atk.Speed +10%, allows casting Repeat Mark Somersault, Alluring Conduct, and Melody of Refection. Cancels if any of these skills are used. Swift Praise 85 For 4 sec. increases all party members' P. Atk./M. Atk./Atk. Spd./Casting Spd. by 150%. Cooldown 8 seconds. Melody of Refection 85/90/95/99/101/103/105 Instantly recovers your MP and nearby party members' MP up to 700/715/725/740/755/768/786 according to their levels and decreases the remaining cooldown of Alluring Conduct by 5 seconds. Can be used in the Triad state. Alluring Conduct 85/86/88/90/92/94/96/98/101/103/105 Attacks the target and nearby enemies with 23178/24105/25959/27813/29667/31521/33375/35229/38010/39864/41718 Power added to P. Atk. and decreases Atk. Spd./Casting Spd./P. Def/M. Def by 50% for 12 seconds. Increases cooldown of all skills by 10%and applies the Swift Praise effect to the caster. Can be used in the Triad state. Requires a sword, blunt, dual sword or dual blunt to be equipped. Wizard's Harmony (Lv. 2) 103 For 30 minutes, the selected party member's M. Atk. +45%, M. Critical Rate +100%, M. Critical Damage +10%, Casting Spd. 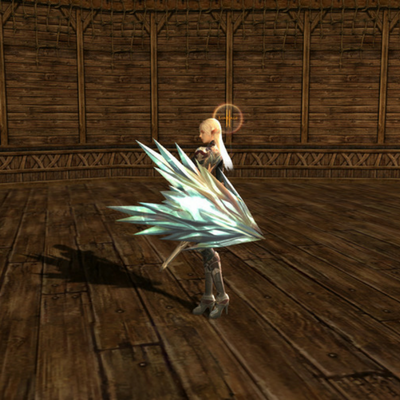 +15%, Attack Attribute +100, Skill Cooldown -20%, and MP Consumption of all skills -15%. Assault Rush Sforzando Sting 85/87/90/93/96/99/101/103/105 Rushes at the target to reduce Movement Speed by 100 for 4 seconds and gives the Swift Praise effect to allies. Requires a sword, blunt, dual sword or dual blunt to be equipped. Death Strike Repeat Mark Somersault 85/86/88/90/92/94/96/98/101/103/105 Attacks the target with 20668/21494/23146/26798/28102/29754/31406/33884/35536/37188 Power added to P. Atk., decreases P. Def/M. Def by 20% and Movement Speed by 150 for 8 seconds, and moves 400 back. Can be used in the Triad state. Requires a sword, blunt, dual sword or dual blunt to be equipped. (passive) 85/90/95/99 Increases Atk. Spd./Casting Spd. by 10%/11%/13%/15% and Attack Attribute by 50/60/80/100. Activates the Single Note effect on you if Sforzando Sting, Radiant Crash or Resolving Bash is cast. Song of Wisdom Song of Assault 101 For 30 seconds increases all Physical/Magic/Skill Critical Rate and Critical Damage of all party members by 15%. Consumes 5 Spirit Ores. — Skill effect area of Song of Silence has been increased. (trigger) The Spectral Sword attacks the target with 100 Power added to P. Atk. and decreases P. Def/M. Def by 20/50/100/150/250 and Movement Speed by 0/0/0/80/80 for 10 seconds. Dancing Phantom Blade 85/86/88/90/92/94/96/98/101/103/105 Attacks the target and nearby enemies with 27268/28358/30538/32718/34898/37078/39258/41438/44708/46888/49068 Power added to P. Atk. to make them unable to target you and decrease their P. Atk./M. Atk./P. Def./M. Def./Movement Speed by 50% for 10 seconds. Enemies with the Spectral Slash Stage 3 or higher can remove these debuffs. Requires a sword, blunt, dual sword or dual blunt to be equipped. Over-hit. Critical. Warrior's Harmony (Lv. 2) 103 For 30 minutes, the selected party member's P. Atk +25%, P. Critical Rate +100%, P. Critical Damage +85%, Atk. Spd. +10%, and Movement Speed +10. A chance to add the Spectral Slash effect to the target. (passive) 85/90/95/99 Increases P. Atk./M. Atk. by 15% and P. Skill Power by 5%. Activates the Spectral Slash effect on the target if Trace of Twin Edges, Shadow Blade or Resolving Bash is cast. Dance of Might Sword Waltz 85 For 30 minutes, increases your P. Atk. and Atk. Spd. by 15% and P. Critical Rate/Movement Speed by 10. 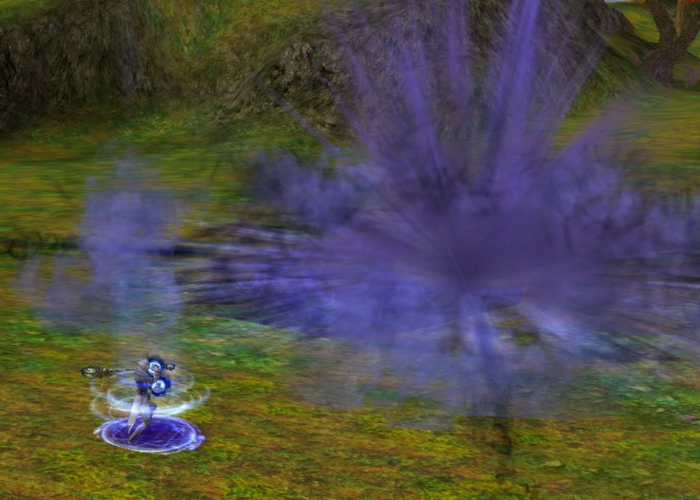 A chance to apply the Spectral Slash effect on the target when a basic attack is made. Death Strike Phantom Slasher 85/86/88/90/92/94/96/98/101/103/105 Attacks the target with 24801/25793/27777/29761/31745/33729/35713/37697/40657/42657/44641 Power added to P. Atk. to reduce its P. Atk./M. Atk./P. Def./M. Def. by 20% for 10 seconds. The target can remove these debuffs if it has Spectral Slash Stage 3 or higher. Requires a sword, blunt, dual sword or dual blunt to be equipped. Over-hit. Critical. - Crippling Dance 101 For 30 seconds, all party members' P. Atk./M. Atk. +25% and Physical/Magic Skill Power +15%. Consumes 5 Spirit Ores. 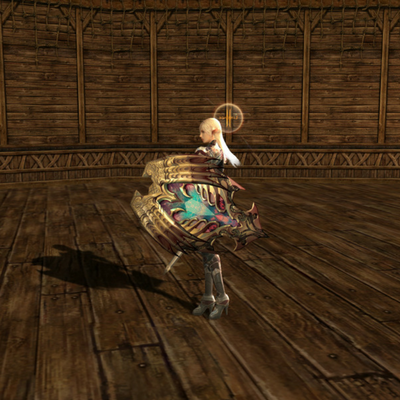 Crier's Harmony 85 For 30 minutes, selected party member's P. Atk. +22%, M. Atk. +40%, P. Critical Rate/M. Critical Rate +100%, P. Critical Damage +70%, and Atk. Spd./Casting Spd. +15%, and Skill Cooldown -20% and MP Consumption of all skills -15%. Soul Cry Grand Soul Cry 85/90/95/99 P. Atk., P. Def, M. Atk. and M. Def +14%/16%/18%/20% and P. Skill Power +5%. Increases the chance to activate additional effect when the Rampageous Beat is cast. Death Strike Rampager's Beat 85/86/88/90/92/94/96/98/101/103/105 Attacks the target with 21642/22507/24237/25967/27697/31157/32887/40673/42657/44641 Power added to P. Atk. and resets the duration of nearby allies' War/Marching/Relax buffs with a certain probability. Requires a sword, blunt, dual sword, or dual blunt to be equipped. Over-hit. Critical. - Chant of Bison 101 For 5 minutes, all party members' P. Atk./M. Atk. +15% and Physical/Magic Skill Power +5%. Consumes 10 Spirit Ores. Vanguard of Baylor 99 Summons the Dominant Flag that cannot be targeted. If used near the Dominant Flag, it applies the effects of Melody, Harmony, Drum, Ditty and Rhapsody buff skills to all clan members (Melodies/Harmonies/Drums -> Frenzies, Rhapsody->Dignity, Battle Ditty -> Command For Battle, Protective Ditty -> Command For Defense, Elemental Resistance ->Elemental Endurance, Debuff Resistance ->Debuff Endurance) and enhances Seal skills (Lv. 4 or higher). Also makes the caster immune to Pull. Renders invincibility for 10 seconds. Flag restores 5% of CP every 3 sec. Consumes 5 Spirit Ores. Grand Vanguard of Baylor 85/90/95/99 PvP damage +10% and Max MP/CP +20%. Seal of Extortion 85 For 10 seconds, Heal received by the target and nearby enemies -85%. For PvPs near the Dominant Flag, applies the Seal of Limit with the effect of limiting the maximum HP/MP/CP Recovery to 40%. Mass Blockade Seal of Confusion 85 Cancels nearby enemies' targets. For PvPs near the Dominant Flag, applies the Seal of Loss with the effect of blocking normal attacks for 10 seconds. Ultimate Suspension Seal of Suspension 85 For 10 seconds, physical/magic skill cooldown of the target and nearby enemies +100%. For PvPs near the Dominant Flag, applies the Seal of Restriction with the effect of blocking the use of physical/magical skills and preventing Invincibility. Consumes 5 Spirit Ores. Spike Shield Raise Shield 85/90/95/99/100/102/104 For 10 seconds activates the Shield Block buff, P. Def +50%/60%/70%/80%/90%/100%, Damage Reflection +0/0/0/10%/10%/10%, chance to receive a Critical hit -100%. Becomes inactive when using a shield skill. - Focus Shield 85/90/95/99/100/102/104 For 10 seconds activates the Shield Block buff, M. Def +50%/60%/70%/80%/90%/100%, Damage Reflection +0/0/0/10%/10%/10%, chance of receiving an M. Critical Hit -100%. Becomes inactive when using a shield skill. - Final Ultimate Defense 85/90/95/99/100/102/104 Activates Shield Block for 30 seconds and reduces the maximum damage received to approximately 1000/900/800/700/600/550/500 in inverse proportion to your P. Def. Impossible to use Raise Shield/Focus Shield. Requires a shield to be equipped. (passive) 85 When receiving damage, increases Shield Def. and reduces Raise Shield/Focus Shield cooldown by 5 seconds for 10 seconds. Increases the level of effect stacking and increases the duration of Shield Block by 25%. Additionally increases STR by 2. Aggression Aura Provoke Aura Provokes nearby enemies into attacking you and decreases their Atk. Spd. and Casting Spd. by 20%. Your P. Def. and M. Def +20% and Movement Speed +45. Can be used with other Auras. - Challenge Aura For you and your party members Skill MP Consumption -15% and the cooldown of all skills -5%, and Movement Speed +20. Only one Knight's Aura can be active at any time. - Noble Sacrifice 91/96/103 For 10 seconds, receives 30%/40%/50% of the damage received by the party and activates the Last Patience effect that prevents your HP from dropping below 1. - Protection of Faith 85/97/100/102/104 For 15 seconds, reduces the maximum damage received by party members to approximately 1000/900/850/800/750 in inverse proportion to your P. Def and increases Movement Speed by 80. Makes you immune to Hold and Stun. This effect cannot be stacked with the same effect or Nine Aegis, and a limit applies after its duration is over. Requires a shield to be equipped. 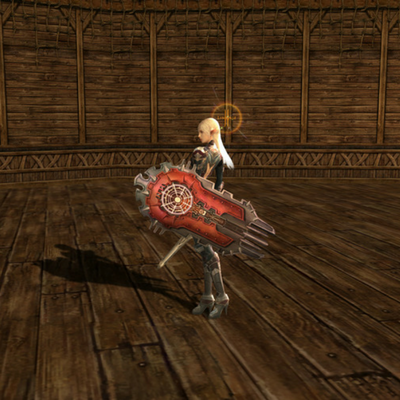 Party Rescue Nine Aegis 99 Creates the Protection Barrier for 15 seconds with 9 shields, which increases P. Def/M. Def/Bow Resistance of party members within the area of effect by 50% and their Reflect Magic by 25% and makes them immune to Pull Up/Knock Back/Knock Down/Danger Zone debuffs. This effect cannot be stacked with the same effect or Nigh Aegis, and a limit applies after its duration is over. Requires a shield to be equipped. Superior Aggression Shield Boomerang 85/87/90/93/96/99/101/103/105 Throws the shield at the target to attack it with 11738/12450/13162/13874/14586/15298/18045/19013/19981 Power added to P. Atk and provoke it into attacking you for 5 seconds. In PvP, it also decreases Movement Speed by 70. Requires a shield to be equipped. - Shield Charge 85/87/90/93/96/99/101/103/105 Uses a shield to rush target with 13634/14179/15269/16359/17449/18539/19629/20719/22354/23444/24534 Power added, reducing their Movement Speed by 120 for 3 seconds. Requires a shield to be equipped. Last Judgment Shield Bash 85/86/88/90/92/94/96/98/101/103/105 Attacks target with 16556/17218/18542/19866/21190/22514/23838/25162/27148/28472/29796 Power added to P. Atk. and Stuns for 5 seconds. In PVP, Restrains normal attacks. Can be used while a sword or blunt weapon is equipped. Over-hit. Critical. - Shield Impact 85/88/91/94/97/101/103/105 With the wave of the shield, attacks enemies in front with 10314/11026/11738/12450/13162/13874/14586/15298 Power added to P. Atk., pushes them to a short distance, and releases the target with a certain probability. Requires a shield to be equipped. - Shield Wave 87/89/91/93/95/97/99/101/103/105 Attacks the targets near you with 10174/10833/11492/12150/12809/13468/14126/14897/15623/16349 power added to P. Attack and inflicts Stun for 5 seconds. Grants Wave Barrier effect for 10 seconds (P.def. +50% and reflects damage when hit. Cannot be applied together with any Shield Block skill). Requires a shield. Punishment Vanishing Stun 85/87/89/91/93/95/97/99/101/103/105 Attacks target with 20451/22087/23723/25359/26995/28631/30267/31903/34357/35175/36811 Power added to P. Atk, and Attack/Casting Spd. is reduced by 20% seconds for 3 sec. Has a chance to Silence target. If in a Two-Hand Stance, Decreases P. Def. Requires a sword or blunt weapon to be equipped. Over-hit. Critical. Gust Blade Rising Smash 85/87/89/91/93/95/97/99/101/103/105 Attacks nearby targets with 10314/11026/11738/12450/13162/13874/14586/15298/18045/19013/19981 Power added to P. Atk and Heal Received is reduced by 90% for 5 seconds. Can be used while a sword or blunt weapon is equipped. Over-hit. Critical. Chain Galaxy Chain Gust 85/87/89/91/93/95/97/99/101/103/105 Swings the chain to attack nearby enemies with 14300/14789/15769/16748/17727/18707/19686/20666/23468/24612/25756 Power added to P. Atk. and holds them for 5 seconds. Requires a sword or blunt to be equipped. Over-hit. Critical. - Chain Strike 85/87/90/93/96/99/101/103/105 Swings a chain to draw the target to you. Requires a sword/blunt to be equipped. True Vanguard Two-handed Stance 85/90/95 Holds a weapon with both hands. If the weapon is a sword or blunt, this stance increases P. Critical Rate/P. Critical Damage by 15% and P. Atk. by 100%130%150% of Shield Def. but disables you to cast shield skills or defend with the shield. Use the stance again to cancel it. Requires a shield to be equipped. Atk. Spd. +15%/20%/25%/30% Increases Shield Def. by 5%/10%/15%/20%, Debuff Resistance by 30%. Additionally increases the duration of Last Patience by 50%. (Sigel Hell Knight) Increases Shield Def. by 5%/10%/15%/20%, Damage Reflect +25%, Movement Speed by 70. A chance to activate Lightning Strike if Vanishing Stun is additionally cast. — The maximum number of summoned cubics has been adjusted to 2. 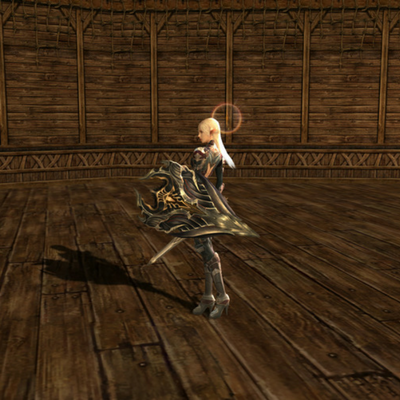 — The enchantment for Raise Shield (old name Spike Shield) has been changed Might->Shield. Summon Phoenix Cubic 85/90/95/99/101/103/105 Summons the Phoenix Cubic, which recovers your HP by 2000/2600/3200/3800/4400/5000/6000 every 15 seconds, releases debuffs, and increase debuff resistance by 60%. Resurrects after death (30 min cooldown). Flame Feather 95/98/101/103/105 Fires the Flame of Phoenix to attack nearby enemies with 35222/38826/43471/45591/47711 Power added to P. Atk. and provoke them into attacking you for 5 seconds. Requires a sword or blunt to be equipped. Over-hit. Critical. Phoenix Glide 97/98/99/101/103/105 Sends the Phoenix to attack the target and nearby enemies with 17927/18411/18895/19863/20831/21799 Power added to P. Atk. and provokes them into attacking you for 5 seconds. Decreases normal attack ranges of Bow and Crossbow by 500. Consumes 500 Soulstones. Requires a sword or blunt to be equipped. Over-hit. Critical. (passive) 85/90/95/99 Increases P. Def/M. Def by 9%/11%/13%/15%, Shield Def. by 5%7%/10%/15%, and Shield Def. Rate by 5%6%/8%/10%. If Shield Block skill is cast, Phoenix Spirit is activated on party members. Riot Shield Burning Chain Rash 85/89/91/93/95/97/99/101/103/105 Wields the Burning Chain to draw nearby enemies with 10833/11492/12150/12809/13468/14126/14897/15623/16349 Power added to P. Atk. and draw them to you. Also puts them into the Ignite state for 10 seconds. Requires a sword/blunt to be equipped. Over-hit. Critical. Black Thorn Chain Strike 89/91/93/95/97/99/101/103/105 Swings the Black Thorn Chain to attack the target and enemies on the path with 10833/11492/12150/12809/13468/14126/14897/15623/16349 Power added to P. Atk. and draw them to you. Also recovers your HP by 10%. Requires a sword/blunt to be equipped. Revenging Thorn 95/98/101/103/105 Shoots Revenging Thorns to draw nearby enemies with 34353/35201/36897/38593/40289 Power added to P. Atk. and draw them to you. Recovers 5% HP and has longer range and stronger effect if cast with Lv. 5 Grand Fortress. Requires a sword/blunt to be equipped. Over-hit. Critical. (passive) 85/90/95/99 Increases P. Atk. by 3%/6%/8%/10% and Reflect Damage/Reflect Magic by 5%/9%/12%/15%. Activates the Avenging Will with a chance of 30% on you when you attack and activates the Spirit of Revenge on your party members with a certain chance when you are hit. Shadow Slash Shadow Hunt 97/98/99/101/103/105 Summons the Blood Panther to attack the target and enemies on the path with 33505/34353/3520136897/38593/40289 Power added to P.Atk. and decrease their Movement Speed by 140 and Pull Resistance by 25% for 3 seconds. Requires a sword or blunt weapon to be equipped. Over-hit. Critical. (trigger) Removes debuffs and increases for 5 sec P. Atk./M. Atk. by 2%/3%4%/6% and Damage Reflection by 5%. Avenging Will For 5 sec., recovers 900/1500/2400/3000 HP, P. Critical Damage +25%, and makes immune to debuff. Blood Chase Blood Panther passive. Becomes immune to debuffs, increases Movement Speed by 150 and recovers HP. For 3 sec. 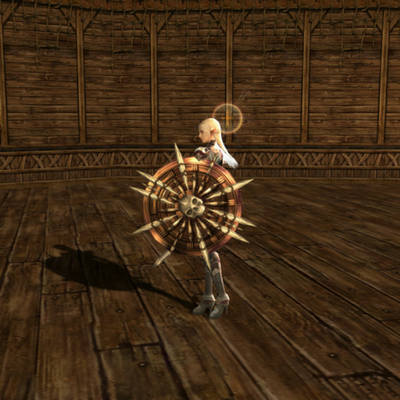 decreases the target's Movement Speed by 80 and increases P. Critical Damage received by the target by 30%. Can trigger Avenging Will on Panther. Gigantic Wave 89/91/93/95/97/99/101/103/105 Summons a huge wave to attack the target and enemies on the path with 10833/11492/12150/12809/13468/14126/14897/15623/16349 Power added to P. Atk. and draw them to you. Requires a sword/blunt to be equipped. Maelstrom 95/98/101/103/105 Creates a maelstrom to draw nearby enemies with 35222/38826/43471/45591/47711 Power added to P. Atk. and draw them to you. Requires a sword/blunt to be equipped. Over-hit. Critical. (passive) 85/90/95/99 Increases P. Def/M. Def by 9%/11%/13%/15%, Shield Def. by 5%/9%/12%/15%, and all Defense Attributes by 50, and decreases Skill Cooldown by 5%. If Shield Block is cast as well, Eva's Presence is activated on allies. Mass Freezing Strike Reversal Stream 97/98/99/101/103/105 Creates a torrent to attack the target and enemies on the path with 18151/18641/19131/20111/21091/22071 Power added to P.Atk. and pull them up a short distance. Also reduces their Movement Speed by 100 for 10 seconds. Consumes 6 Soulstones. Requires a sword or blunt weapon to be equipped. Over-hit. Critical. Eva's Presence For 5 sec. increases P. Def/M. Def by 9%/11%/13%/15% and all Defense Attributes by 45. Summon Melody Cubic Summon Othellot Cubic 85/90/95/99/101/103/105 Summons the Othellot Cubic, which recovers the summoner's HP by 5%/5%/6%/7%/8%/9%/10% and MP by 5%/6%/7%/8%/9%/10%/10% and removes debuffs. Cooldown is 10 sec. Summon Guardian Cubic Summon Spirit Hawk Cubic 85/90/95/99/101/103/105 Summons the Spirit Hawk Cubic, which for 7 sec. increases the summoner's P. Def/M. Def by 200/250/290/320/350/375/400, Movement Speed by 30 and Shield Def. by 5%/7%/10%/13%/15%/17%/20% and makes him immune to debuffs. Cooldown is 15 sec. (passive) 85/90/95/99 P. Atk. +2%/3%/4%/6%, Shield Def. +5%9%/12%/15%, and Attack Attribute +15/20/25/30, and activates Shilien Shadow on the caster. 6% chance to activate Shilen's Presence on party members. Shillien Shadow 85 For 6 seconds removes debuffs and limits the maximum damage received to 6666. Chained Death Scythe 89/91/93/95/97/99/101/103/105 Summons a scythe to attack the target and nearby enemies with 10833/11492/12150/1809/13468/14126/14897/15623/16349 Power added to P. Atk. and draw them to you. Requires a sword/blunt to be equipped. Inhale Soul 95/98/101/103/105 Creates a pit of darkness to draw nearby enemies with 35222/38826/43471/45591/47711 Power added to P. Atk. and draw them to you. Requires a sword/blunt to be equipped. Over-hit. Critical. - Shilen's Presence For 5 sec. increases P. Atk./M. Atk. by 2%/3%/4%/6% and Attack Attribute by 5/10/15/20. Summon Phantom Cubic Summon Death Cubic 85/90/95/99/101/103/105 Summons the Death Cubic, which recovers the summoner's HP by 1300/1700/2100/2500/2900/3400/3950, removes debuffs and increases Debuff Resistance by 6%/16%/26%/36%/46%/56%/66%. In addition, Shillien Shadow is activated on the summoner if he defeats the enemy. Cooldown is 13 sec. — Fixed an issue with 'Dignity of the Exalted (Level 4/5)", "Vitality of the Exalted" skills' effects not being applied when changing to dual class. — Fixed an issue with element toggle skill becoming inactive when Feoh Wizard unmounts. — Fixed an issue with skills that target the ground surface that could not be used while moving. — Fixed an issue with DoT effects that took effect even with active invincibility. Heart Breaker New effect has been added: Side Critical Damage +30%. Istina Acid Swarm P. Atk. decrease effect has been removed. Additional Atk. Spd. decrease by 50%. Now Decrease Speed is 50%. Aloner's Tact Critical Rate and Damage from the front/behind is now 50%. Maximum Blow Cooldown has been decreased from 300 seconds to 150. Skill duration has been changed from 20 seconds to 120. Skills Heart Breaker/Chain Blow cooldown reset effect has been added when using Reverse Mana. Reverse Mana Cooldown was changed from 7 to 10 seconds. Armor Breaker P. Def. decrease is now 50% when used on NPC (in PvE). Right Angle Reverse Bleed effect has been removed. Stun for 3 seconds has been added. Cooldown was increased from 5 to 6 seconds. Eastery Walking Speed decreasing effect was removed. (After Eastery Walking) Skill that is triggered by Eastery Walking. Lv. 2: An effect that was used beforehand retains; duration is 3 sec. Gust Movement P. Evasion was changed, now it’s rate is 100%. Superior Haste Shadow Dash duration doubling effect was added. 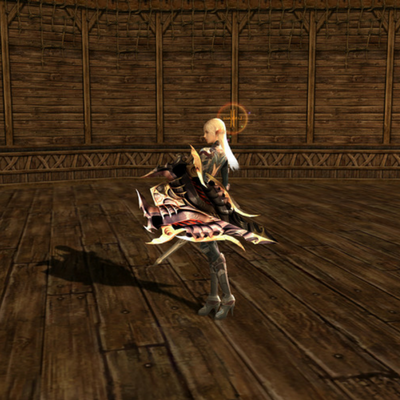 — The "Empowering Echo" skill has been added for all Feoh classes. Elemental Attribute Stances The leveling of Elemental Harmony has been deleted. MP Consumption has been deleted. Duration has been changed to 5 sec. Increases Attack Attribute by 100. Holy Stance Damage Increase +5% effect has been added. Elemental Burst (Holy Stance) Stun duration has been changed 3 -> 5 sec. Grand Abyss Stigma Damage Increase +5% effect has been added. Soul Barrage Character is invincible when casting. — Garden of Spirits has been adapted for players Lv. 102+. — The quest rewards have been adjusted accordingly. — Doors to Boss Harpa have been removed. — Isabella gains more power from the Spirit Evil Thoughs. Removed restart restrictions, removed My Teleport restrictions, removed Class Change restrictions, removed summon restrictions, removed "Belief of the Exalted" usage restrictions. — Fixed an issue when a character was not able to get inside Nornil's Cave via Boz Core. — Fixed an issue when a character was able to use multiple keys from Giants' Room of Relics. — Fixed an issue where a character got damaged in Mystic Tavern - Kain when Alfred von Hellmann used “Hellmann Stun Blast”. — Fixed an issue when after Fortress Spy uses "Spy's Aid Request" in Atelia Fortress mobs didn't spawn. — Superion Zone can now be entered via NPC Kekropus in Giran without completing the "Superion Appears" quest. — The Elven Village is now a Peace Zone. — Shadow of the Mother Tree has been reworked for solo and group hunting Lv.103+. — There's a chance that a Lithra's Bud appears. If it evolves, it will spawn new monsters. — Lithra's Bud can evolve into Nerupa's Bud. The higher the Amity Level with Guardians of Mother Tree, the higher is the rate. — When Nerupa's Bud evolves, it will spawn new monsters. — New Raid Boss Lithra spawns every 12 hours. — Labyrinth of Kartia has been reworked for faster completion, group version has 3 stages. — Floors 36-45 have been added to the Dimensional Warp with a possibility to skip certain floors by completing quests. — Depending on a number of the quests completed, NPC inside will let you skip a certain amount of floors. — With the addition of new floors, the rewards given by Abyssal Makkum at Stage 35 have been revised. — Boss monster Otherworldly Makkum appears at Stage 45. 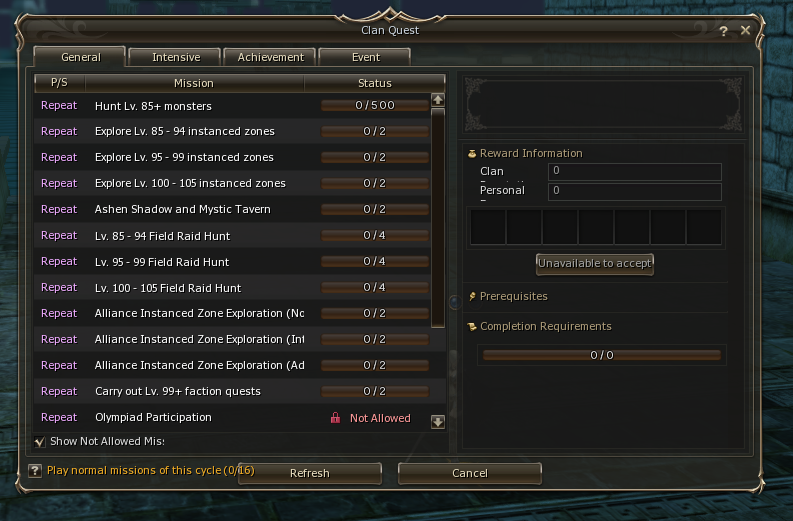 — Added 2 new The Dimensional Warp quests that can be obtained at NPC Resed. — Spezion (Extreme) has been upgraded to Lv. 103+. Quest items are no longer needed to enter any Spezion, CC requires 14-21 characters. — Tauti requires a new quest, items are no longer needed. — Mystic Tavern has been reworked and rebalanced for easier completion. 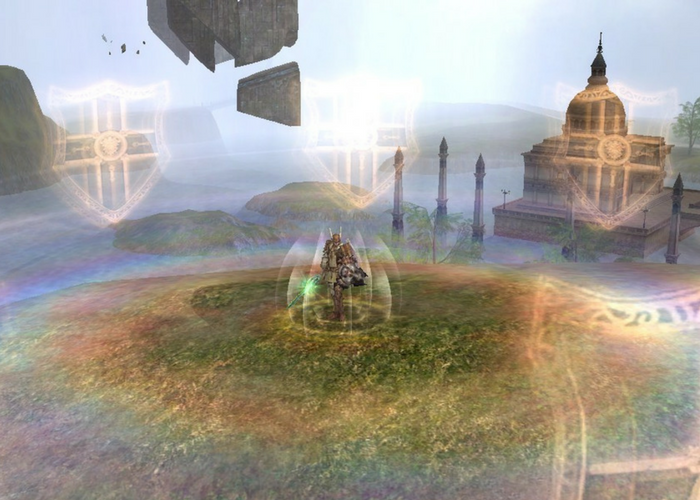 — Etinah Great Temple is a party zone for characters level 103-110. It's the place where you can fight Etis van Etina and Kain van Holter. — You can only get to Etinah Great Temple in the same week when Keucereus Alliance Base Defense was successful. Talk to NPC Keucereus Spy Erda from Keucereus Alliance Base to teleport to the zone. — The battle takes place on Saturday from 9 till 0 p.m. If you don't manage to defeat Etis van Etina and Kain van Holter by the time, the raid is lost. — To access, you need a command channel of 70-120 characters level 103 and above. At least 35 characters should have Blackbird Clan and Kingdom’s Royal Guard amity level 4 or above. In the first part, you need to move to the entrance of the Temple, defeating mobs and the Great Temple Guardian Paragon. If during the raid your party members are killed and the battle is stopped, the mobs go back to their starting places. The server which has been the quickest to defeat Paragon gets the right to fight Etis van Etina. Others will fight Kain van Holter. Paragon has 1 145 9707 450 HP and doesn't drop rewards. When Paragon is defeated, the second part begins with a system announcement which server gets which boss. The main reward from Etis van Etina/Kain van Halter raid is Bloody/Dark Helios/Eternal Stones. Besides basic attacks, Etis van Etina or Kain van Holter use Seven Signs depending on how much HP they have. Each Sign casts different debuffs on the characters and empowers the bosses and their minions. Etis van Etina or Kain van Holter summon minions every 2 minutes. If you don't manage to defeat Kain van Holter, Etis van Etina gets the Protection of Seven Seals buff which makes him even stronger. 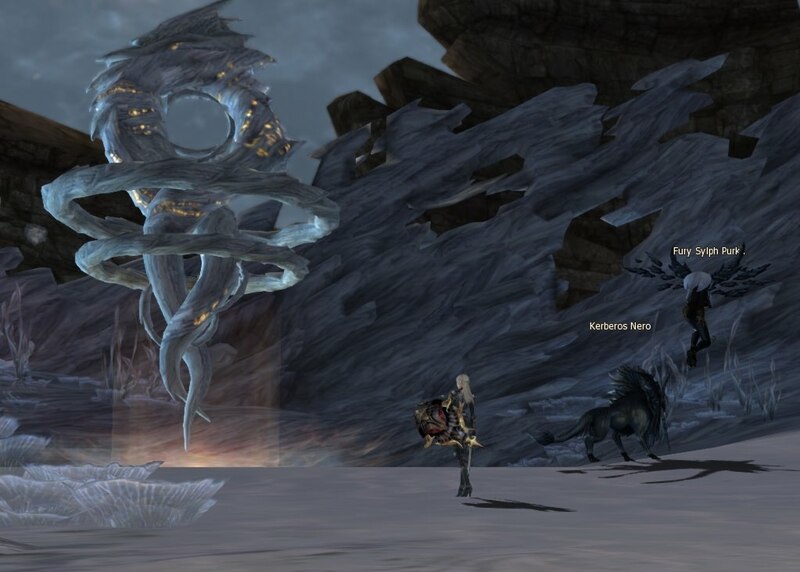 If your raid in Etinah Great Temple is successful, then on the server which fought Etis van Etina and on the servers where Kain van Holter was defeated, a special NPC appears: Embryo Victory News Messenger of Victory. The messenger gives the "Savior's Blessing" buff, giving for XP bonus and SP +100% for 1 hour. If the server which fought Etis van Etina failed the raid, no server gets any buff. — Fixed an issue with some Raid Bosses not cast Raid curse on characters who are 9 levels higher than the Boss. 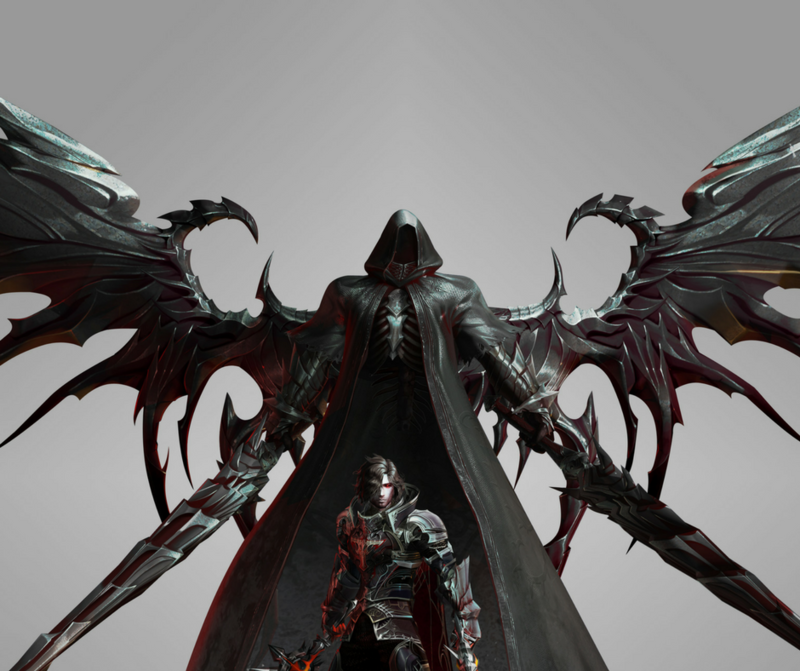 — After Raid Boss Lv.100+ dies, there’s a chance that Death Reaper will appear. Level and drop of Death Knight is the same as the killed Raid Boss. — Raid Bosses Lv.100+ use Limit Barrier skill when their HP drops to 90%, 60%, and 30%. — If the Limit Barrier is not destroyed within 15 seconds, the Raid Boss fully recovers its HP. — To destroy the Limit Barrier you need to hit the Raid Boss 600 times with any attack within the given period. — Sixteen new Raid Bosses Lv.101-105 have been added. — The following Wasteland field raid boss NPCs no longer appear spawn: Rose, Thorn, Giant Wasteland Basilisk, Gargoyle Lord Sirocco, Ragraman. — The locations of Harp's Clone and Embryo Dabos have been changed following the rework of the Shadow of the Mother Tree hunting ground. — Agathion system has been changed: now all agathions are divided into two parts: Agathion bracelet and Agathion Charm. — When you equip a bracelet, a special interface with Agathion slots appears. Available slots are highlighted. — If no Agathion was equipped, the first Agathion is inserted into the main slot. — A new item has been added - Seed Bracelet. 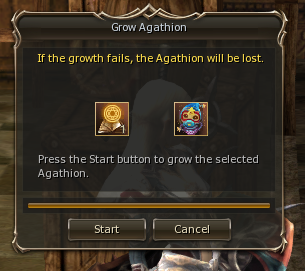 — Seed bracelet cannot be improved and has only 1 Agathion charm slot. — Several Agathion Bracelets items have been changed to their charm equivalent. — The Agathions that were not exchanged remain the same - they are still equipped to the left bracelet slot and can be summoned. 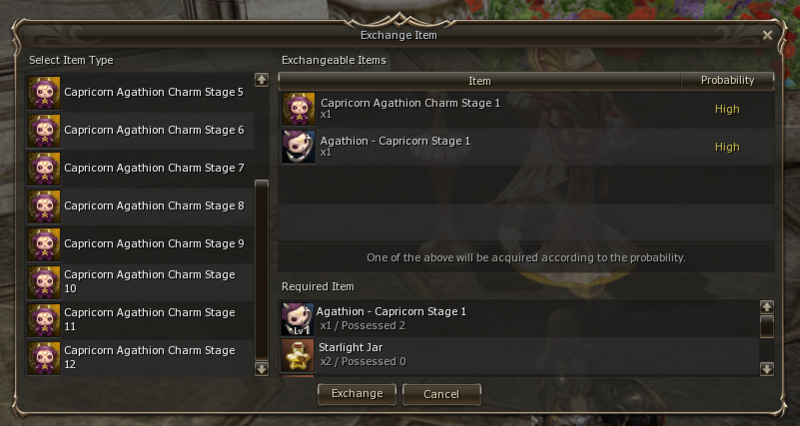 — Now you can improve your Zodiac Agathion and either exchange it for a charm, or for an Evolved Bracelet. — Agathion Charm's stage cannot be increased through Compound or exchange. If you need the highest stage of Agathion Charm, you have to bring the highest old Agathion Bracelet to Dimensional Merchant (e.g. old bracelet stage 12 → Agathion Charm stage 12). — Starlight Jar can be obtained by crystallizing old Zodiac Agathions. — Zodiac Agathion charms can be enchanted with a special item: Zodiac Agathion Book Of Growth that can be obtained via NPC Dimensional Merchant for 20 000 000 adena. — Zodiac Agathion Book Of Growth provides safe enchantment up to +3, maximum enchant level is +10. — If enchantment fails, the Agathion Charm disappears. — Ancient Zodiac Agathion Charm Books of Growth can enchant the Agathion Charms randomly between +1 and +3 when it succeeds, but the Agathion Charm disappears if the enchantment fails. These books can be obtained during some events or L2Store promos. — Zodiac Agathion Bracelet (Stage 12) can be exchanged for Evolved Zodiac Agathion at NPC Ferris. Stages 1-11 cannot be upgraded at Ferris. Agathion Charms cannot be upgraded either. — NPC Ferris in Aden offers options to exchange Zodiac Agathion Stage 12 for Evolved Zodiac Agathion with 100% rate. — Evolved Zodiac Agathion is equipped into the same left bracelet slot. — When you equip an Evolved Zodiac Agathion, it is not summoned, but all passive and active skills are activated and can be used. — You can equip a Zodiac Agathion Charm along with Evolved Zodiac Agathion, but if you equip the same type, the skill cooldown will be shared. — A Charm equipped in the main slot of an Evolved Zodiac Agathion also activates its passive and active skills. — A Charm equipped in the lower slots only gives passive effects. — To get the most out if this system, combine different Zodiac agathions, you can get 2 active skills (one from Evolved, one from a Charm in the main slot) and passives from up to 2 other Charms in lower slots. — Evolved Agathion is not destroyed upon failure, but the Red Startlight Jar disappears. — The passive effects such as Stat Boost and Attribude Enchant from Evolved Agathions and Agathion Charms do not stack. 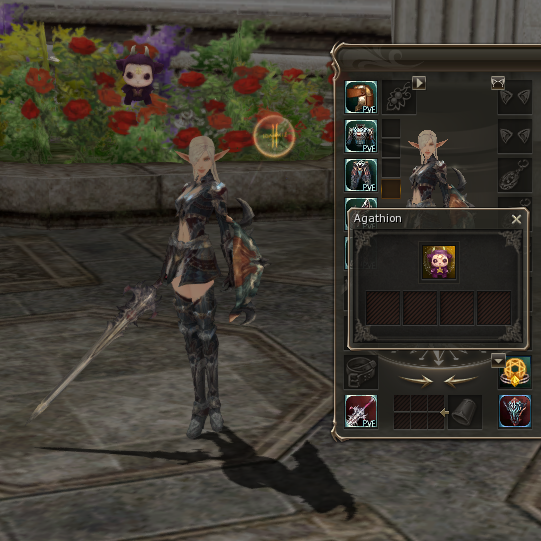 If you already have the Evolved Agathion equipped, you receive the passive stat and attribute bonuses. Even if you equip the Agathion Charm with the same bonuses, they will not stack. 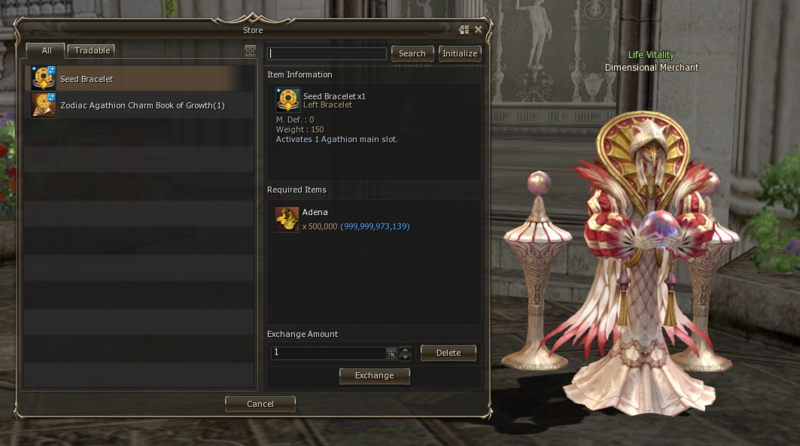 — Agathion Evolution Stone can be obtained during some events or L2Store promos. — Personal Fame Points have been exchanged for "Personal Fame Token" and added to character's warehouse. 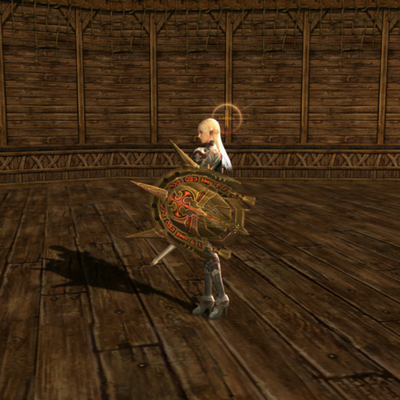 — Skeleton Buckler can now be purchased in Giran at NPC Radia and in Rune at NPC Vladimir and NPC Alisha. — Fixed an issue with characters Lv. 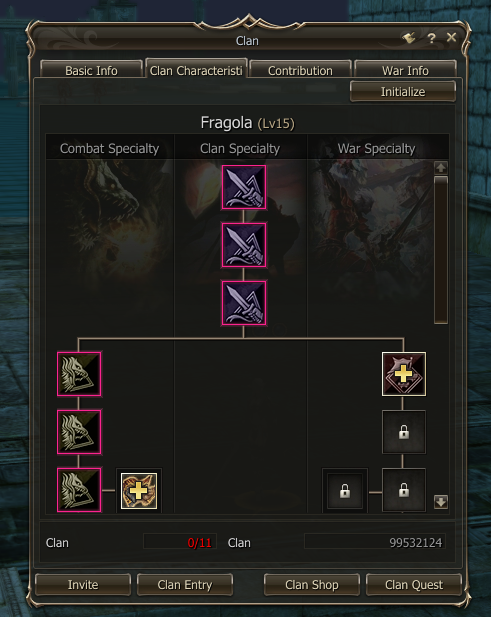 80+ not being able to use the 'Paulina's Equipment Set (S-grade)' item. — Entry items to Tauti and Spezion have been removed. — NPC Pelu in Faeron Village can exchange Fortune Pockets x50 and x500. — New quests have been added to support the development of characters Lv.85-95. — New leveling quest line has been added: Path of Balthus Knights. — The Balthus Knights Quest is available to all Premium accounts. — The characters following the Path of Balthus Knights cannot participate in Mentoring System, several other options (clan invitation, friend invitation, using mail) are also limited until they complete the quest. — The quest is only available at character creation. — The class is chosen based on the selected race in the character selection screen. — The characters that complete the quest obtain only 4th class skills. 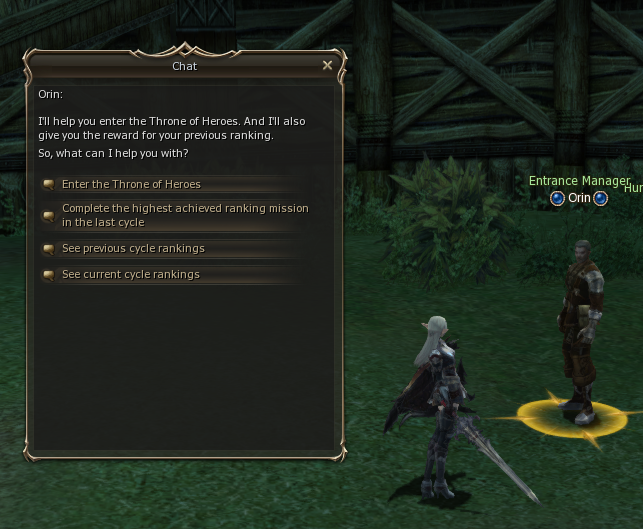 — Adventurer’s Guild faction that provides tutorial quests has been added. 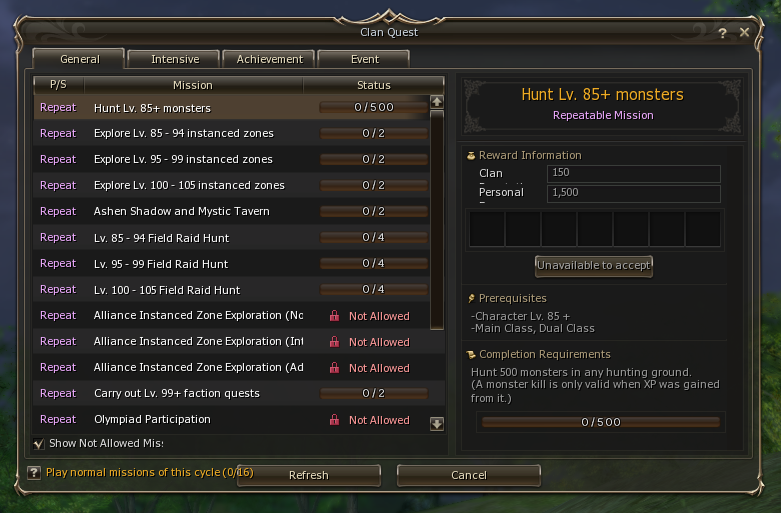 — Four new Hunter's Guild request quests have been added. The quests can be obtained by buying quest scrolls with Raid Points from a Hunter Guild Member. — Mother Tree Guardians maximum Amity Level has been increased to 10. — Maximum Amity Level for Giant Trackers has been increased to 10. — Amity level with Giant Trackers can now be increased in Superion Fortress. — “The Superion Giants” is now a faction quest. — Fixed an issue with the "Path to Finding the Past" quest not being completed even after completing the "Mystic Tavern – Kain's Choice" instance dungeon. — Fixed an issue with some of the faction quests occasionally not giving Amity Points. — The requirements for the quest "Exploring the Dimension - 30-day Search Operation" has been changed from Lv.95-99 to Lv. 95-102. — Fixed an issue with Fish Stews disappearing after declining the quest "Leader’s Grace". — The "Operation: Rescue" quest item distribution method has been changed from "the character who inflicted the last hit" to "a random member of the party". — The minimap can now be zoomed in/out fivefold (previously only threefold zoom was available). — Streets in towns and entrances into buildings are now better outlined. — The location of My Teleport button has been changed. — New icons have been added. — Information about the number of available My Teleport Scrolls has been added. — Daily Mission interface has been replaced with Clan Quests. 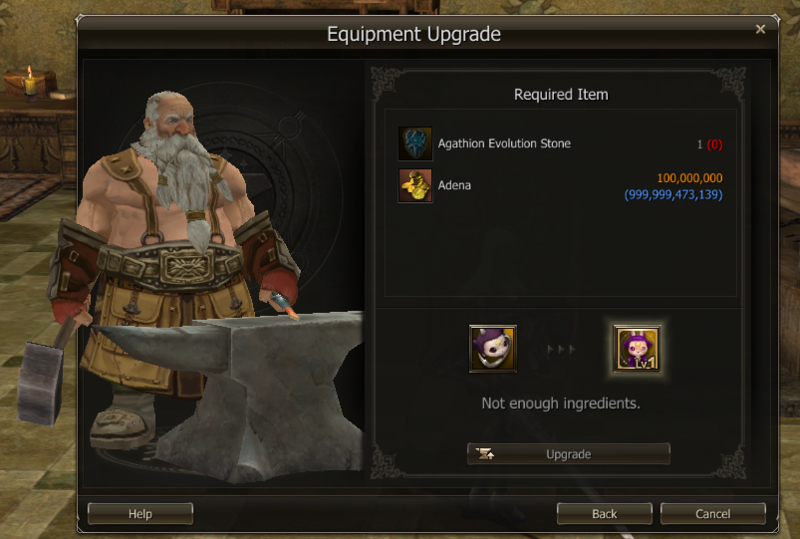 — Fixed an issue with pet's inventory not closing when using Augmentation option at NPC Blacksmith. — Adena distribution no longer can be used when Private Store is active. — Teleportation fee has been changed. Characters with main class Lv.94 and below can use the teleport free. 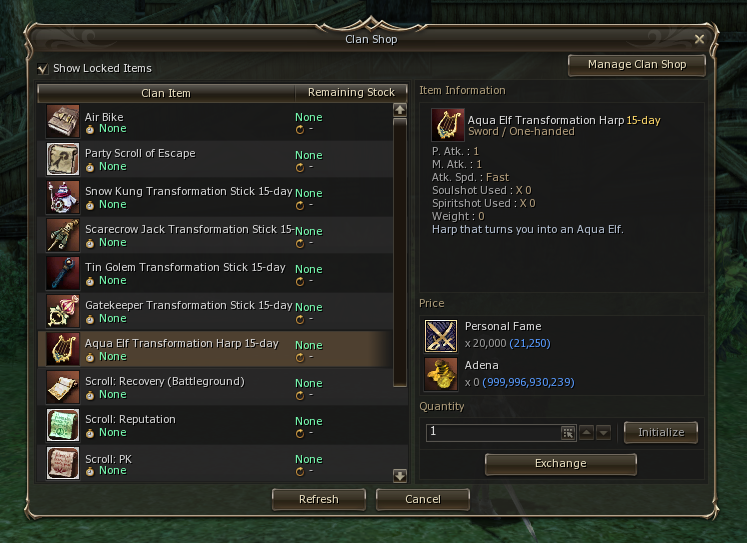 Characters on dual class Lv.85+ still need to pay the required amount of adena. 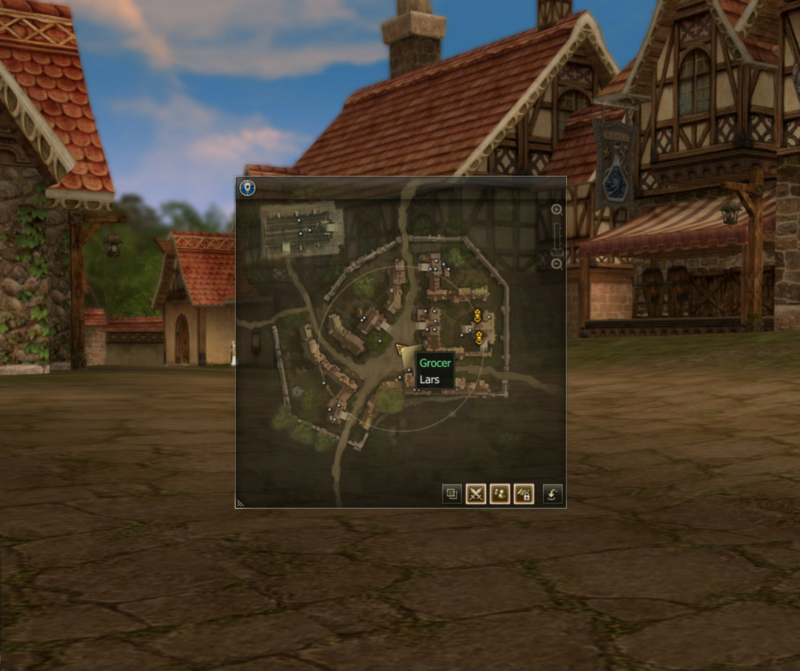 — A new function has been introduced: auto-looting of adena dropped by monsters. The rules of adena distribution remain unchanged. Dropped items are not looted. A monster is attacked and killed by one character Dropped adena is automatically added to the character’s inventory. A monster is attacked and killed by two or more characters, not from the same party Dropped adena is automatically added to the inventory of the character that dealt the most damage. A monster is attacked and killed by two or more characters from the same party Dropped adena is equally distributed among the party members. If a member of the party is outside of the distribution zone, dropped adena is equally distributed among the remaining party members. 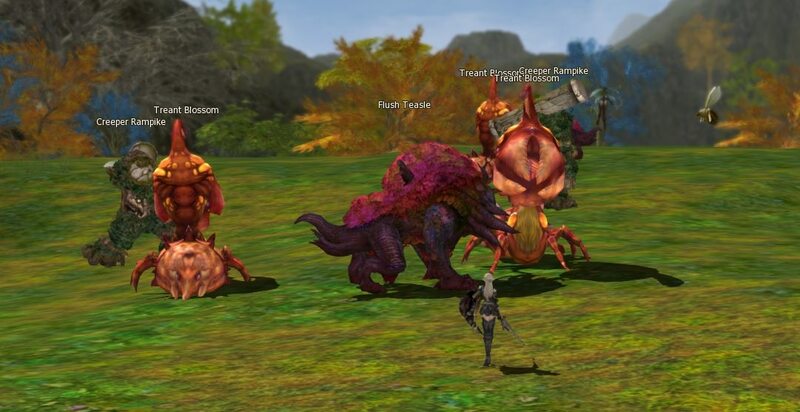 (applies only to Raid Bosses that drop adena If the party with the command channel leader dealt the most damage, adena is equally distributed among the command channel leader's party members. 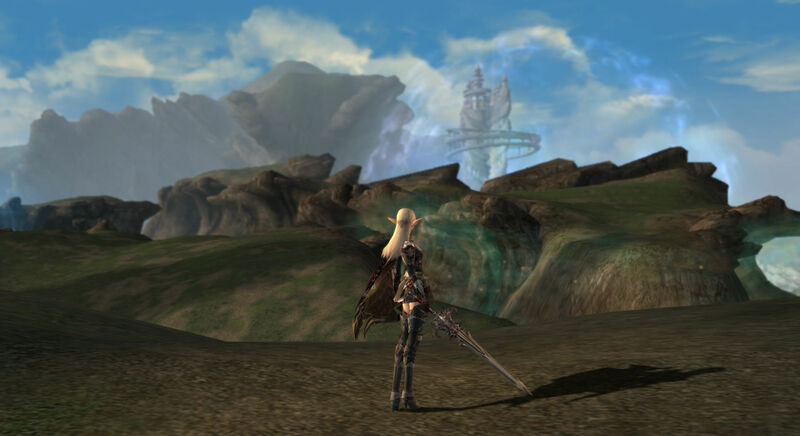 If other party's contribution is higher, adena will drop on the ground and looting access are given only to the command channel leader's party. 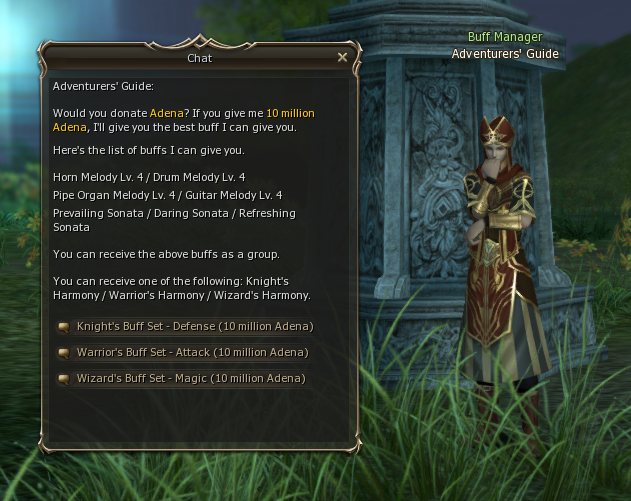 — Adventurer's Guide buffs for characters Lv.94+ can be obtained for 10 000 000 adena or 10 Freya's Frozen Scrolls. — Characters Lv.93 and below can still receive the usual buff for free or the new set by paying the same fee as characters Lv.94+. — Most of the clan management options were moved from NPC to the clan menu. — Keys [A] and [D] can now be used to strafe (previously they were used to turn the camera). — Fixed an issue with pet's body staying midair when a pet died during Aerial Yoke state. — Fixed an issue with the elevator area in the Ancient City Arcan that could be saved as a My Teleport location. — World chat count reset time has been changed from 6:30 to 7:00 server time.